The Nile Project is scheduled to host a series of workshops intended to open dialogue with university students about what a sustainable Nile Basin would look like. Workshops will feature a screening of a 60-minute documentary film on The Nile Project's most recent endeavour, the "Nile Gathering," which took place in Aswan early 2013. The first workshop was held earlier this week at the American University in Cairo, to be followed by two workshops at Cairo University on 2 and 3 December and a workshop in the Bibliotheca Alexandrina on 5 December. Launched in 2011, The Nile Project is a long-term cultural project that aims to foster exchange between Nile Basin countries through music and civil society initiatives. In January 2013, the first major project started with a five day gathering of civil society organisations to discuss Nile sustainability and environmental issues in Aswan. The gathering was followed by a two week musical residency, bringing more than 20 musicians from Nile Basin countries together to create music that fuses the diverse styles of the Nile region. 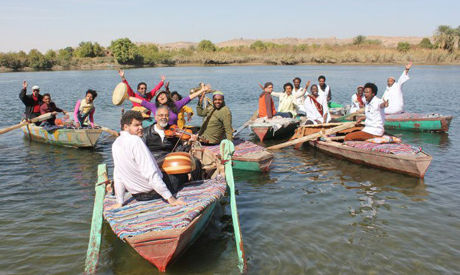 This musical residency culminated in two live performances in January, one in Aswan and one in Cairo, along with an album release dubbed "Aswan." The album was named one of the top 5 albums of the year by NPR music. The next "Nile Gathering" is scheduled to take place in Uganda in early 2014.